This formula repairs 'tears' in the aura. It also helps us address issues of personal boundaries. We learn to recognize the importance of inner & outer protection during our life's journey. Spray any external body part straight after a minor injury or trauma, and feel how fast your body begins to heal. Very popular with healers, energy workers, nurses and body worker practitioners. Note- this spray is not a substitute for professional medical attention. Please use common sense if you are injured. This product truly rocks. Powerful.....It works! 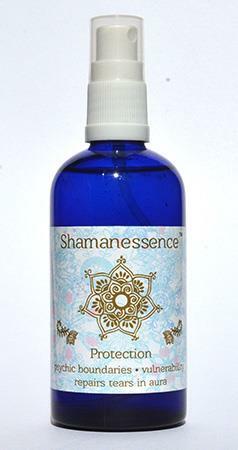 Great results, Expert, High Integrity I use Mariamne's Shamanessence Products. There is nothing out there like them. Her energy to help peoples healing process is amazing, specially for 'Protection', or to counteract the computer's radiation. All of her products are so good, my favorite is Prosperity Spray and Healing Cream. I highly recommended them. I have used this product especially right before I leave my business, so I can have a good return home! Active Ingredients: Crystal Elixirs: Sapphire Ruby, Fluorite, Zircon, Hermeker Diamond, Rose Quartz, Azurite, Covelite, Lapiz Lazulite, Green Jasper, Malachite, Amethyst, Copper, Gold, Silver, Red Beryl, Endlichite, Chronium. Flower Essences: White Bluebell, Mountain Devil, Pineapple, Cauliflower, Mulla Mill, Cancer Bush, Fuchsia, Mullein, Pink Monkey Flower, Yarrow, Pink Yarrow, Golden Yarrow, Arnica, Echinacea, Sea Salt, Nasturtium, Vanilla, Tree of Life, Self Heal. Essential Oils: Rosewood, Balsam Peru, Sage Dalmation, Spearmint. In a Blessed water base, grapefruit seed extract and Love!